Topclass Driving School Gillingham specialises in driving tuition and driving instructor training and was established in 1998. We provide driving lessons in Medway, Gillingham, Chatham, Rochester, Gravesend, Dartford, Maidstone, Sittingbourne, Sheerness, Canterbury, Herne bay and surrounding areas of Kent. Over the past years, we have grown to be one of the most popular and successful driving schools in Gillingham, Kent, with many driving test passes locally. This fast growing Gillingham driving school has rapidly expanded to provide driving lessons in Greenwich, Lewisham and the Bexley areas of London, and more recently into the Ipswich and Bury St Edmunds areas of Suffolk. Our fully—qualified DSA Approved and highly experienced driving instructors will carefully guide you through the learning stages, and when the day of your driving test arrives, you can be sure that you will have the necessary driving skills and knowledge to successfully pass your driving test. Take your driving lessons with Topclass driving school one of Kent's fastest growing driving schools. 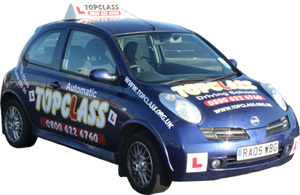 Here at Topclass Driving Schools in Gillingham, Kent, we pride ourselves on our high standard of driving tuition, and by placing your driving ambitions in our hands, you are ensuring the best chance of early success and a high degree of driving skill, which will help you to secure many years of safe driving. We offer manual and automatic driving lessons in dual controlled cars and all lessons are with DSA approved male or female driving instructors. We can offer 1 or 2 hour driving lessons, or why not learn to drive in 1 - 6 weeks with an Intensive driving course. Our services include teaching beginner drivers, in car theory and hazard perception, right through to Pass Plus, refresher and motorway lessons for full licence holders. Our driving instructors cover all the local and major test centres in Kent, and all our driving instructors are CRB certified. Here at Topclass Driving School we believe in keeping our driving lesson prices as competitive as we can without compromising on the quality of service and tuition we provide. This is why we offer driving lessons from as little as £18.90 an hour helping you to save money on your driving lessons. We offer great discounts for block bookings, students, NHS, and armed forces. Check out our Introductory Offers on 3, 5, and 10 hour packages. Driving lesson Gift vouchers are also available for them special occasions. So call us for your driving lessons in Medway, Maidstone, Gravesend, Dartford, and Canterbury areas of Kent. We are a well established Gillingham driving school we have local driving instructors giving driving lessons in Gillingham, Kent, and all of the towns listed (see our areas page). You will receive a one-to-one driving lesson with a male or female driving Instructor, and a training programme tailored for you to your needs and ability, designed to make you a safe, confident driver. For your flexibility you can be picked up / dropped off for your Gillingham driving lessons from home, work, or college at a time suitable for you. So if you live or work in Gillingham, Medway, or any of the areas above why not give us a call and book your manual or automatic driving lessons, or intensive driving course, with Topclass Driving School Gillingham. We welcome Pupils of all ages and abilities and nervous pupils are our speciality. Most of our driving instructors provide driving lessons from 8am till 9pm.